Located Puri is a city and a Municipality of Odisha. It is the district headquarters of Puri district, Odisha, eastern India. 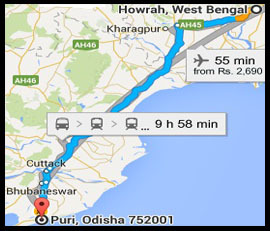 It is situated on the Bay of Bengal, 60 kilometres (37 mi) south of the state capital of Bhubaneswar. It is also known as Jagannath Puri after the 12th-century Jagannath Temple located in the city. It is one of the original Char Dham pilgrimage sites for Indian Hindus. Puri was known by several names from the ancient times to the present, and locally called as Badadeula. Puri and the Jagannath Temple were invaded 18 times by Hindu and Muslim rulers, starting from the 4th century to the start of the 19th century with the objective of looting the treasures of the temple. Odisha, including Puri and its temple, were under the British Raj from 1803 till India attained independence in August 1947. Even though princely states do not exist in independent India, the heirs of the Gajapati Dynasty of Khurda still perform the ritual duties of the temple. The temple town has many Hindu religious maths or monasteries. 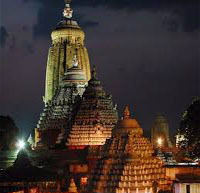 The economy of Puri town is dependent on the religious importance of the Jagannath Temple to the extent of nearly 80%. The festivals which contribute to the economy are the 24 held every year in the temple complex, including 13 major festivals; Ratha Yatra and its related festivals are the most important which are attended by millions of people every year. Sand art and applique art are some of the important crafts of the city. Puri is one of the 12 heritage cities chosen by the Government of India for holistic development.